Three times I have held this moment. A baby in my arms, round-cheeked and solemn-eyed, stretching out his chubby hand towards an ice-cold window, swirls of first snow gusting just beyond the glass. Three times I have watched. Pudgy fingers smudging up against the pane, leaving a breath of fogged fingerprints behind. Brow furrowing, steady eyes silently wondering what is this? Cold and hard are not the usual domain of babies, the newest ones whose softest skin we wrap in fleece blankets and cuddle with feathery kisses. Three times I have felt this sacred hush. What it means to introduce a child to the world outside, a world which can be hard and cold and harsh and cruel. A fleeting foretaste while still safe in mother’s arms of what it will mean for them to brave the beyond. Three times I have welcomed this same invitation. To remember that what is hard can also be holy. The book is here. The hard part should be over. The dreaming and the writing and the editing and the re-editing and the waiting are behind me. This new baby is in my hands, and it is rushing headlong into the world, too. Now all should be calm; all should be bright. Except this is never the way it works, is it? In writing, in parenting, in life. Right when I thought I had hit that sweet spot – of work and family and home all humming along so much better than I dared dream when I pictured life with three kids – right then was the instant something started to unravel. The child care set-up that was steady and smooth? Now yanked out from under us. We’re scrambling to re-calibrate, and everything is up in the whirling air. How to juggle all these callings. How to handle all the good work we’ve been given to do. How to be the partners and the parents we’ve promised to be. All will be well, Julian of Norwich reminds me, in that nagging, knowing truth of the long view. And I believe this. But in the short term? All ain’t great. It’s far from the end of the world, but it’s the complicating of our small world as it spins today. Stress sneaks back in; what’s nicely knit unravels; we run on fumes and we run down. I know we will be fine; we’ve been here before and we’ve come through. But still. And this is still holy. 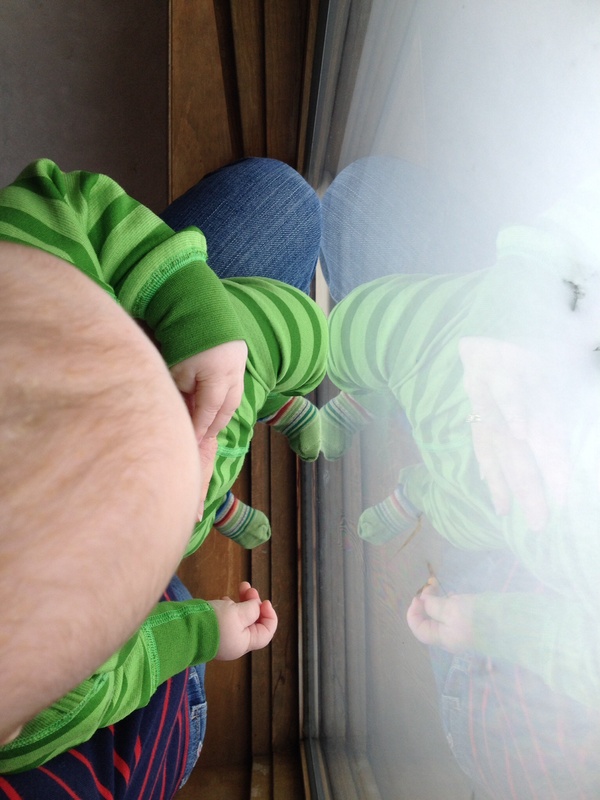 The lesson each baby teaches me, dimpled knuckles banging at snow-streaked window, is that life is always juxtaposed in tensions: soft meets hard, warm meets cold, safe meets scary. These edges press up against each other all the time, but we lull ourselves into thinking we are confidently on the safe side of calm and control. Instead there is hard, and God is here, too. I cannot – will not – say that all that is difficult is divine. There is evil, injustice, abuse, and deceit that cannot be baptized by any best perspective. But among the few stones of hard truth I have collected about God in the few decades I have been seeking, I know this: God is present. When it seems it cannot be so, when we ourselves cannot see it, when the whole maddening crowd screams otherwise. God is present. So whenever there is that too-familiar twisting crunch – of time, of nerves, of expectation, of budget, of hope, of health, of heart – I try to breathe some peace into the space between. To remember how the hard and the holy meet. To turn over and over in my mind this silent memory of first snow: of each quiet, curious baby perched in my arms, peering out into a world of white, a stark new landscape that covers in strange drifts what was once known. To see what their fresh eyes see, to feel what their smooth fingers feel, and to trust what their calm wonder trusts. That they are still held. A few months ago I started going to a yoga class. It’s hard. I expected it to be easier, more flowy. It’s not. It’s getting better, but still, there is more strain and mental cursing and pushing beyond myself than I expected. And I appreciate that more than I’d have thought possible. It has made a world of difference to carry that little phrase with me. When a week is nutty, when deadlines come and go constantly, when people demand and annoy: find the sweet spot. Praying for more sweet spots for you. I feel this way too. Scripture like the Second Reading from Sunday make me feel so strong and rooted in God’s love… like nothing can shake me because he’s protecting me.